The railroad was built in 1882, which is the reason for the town being built here (Route 608) verses the Howardsville pike (Currently U.S.Route 340) where the first house and store had been built. Among the earlier homes built were the C.H. Cohron's and Dodge's Hotel. Dr. Dodge had water piped into the village from a mountain spring, furnishing an adequate supply for the community for many years to come. Sometime, probably around 1910, a large rim, for sounding an alarm in case of fire was on the Dodge property and it is believed to have been gotten off a train. It is currently on display outside the fire house. It is also believed that the two wheeled cart which held the reel of hose was gotten about this time, but Mrs. W.W. McCrary found a record that states "Mr James Bolick made the first piece of fire apparatus for the small community in 1900". This piece of apparatus was used in the first parade held after the company was reorganized in 1950 and is still located at the Fire House. The first fire found in records available, was the Stuarts Draft Mill or Cohron's Mill, was August 22, 1916. Mr Ross Brown stated he remembered them bringing barrels of flour out of there and many of them burst from the rough handling, spreading flour everywhere. At one time there was a cannery located beside the house now occupied by Edmond and Marjorie Hogsett, which burned September 18, 1920 and was never rebuilt. On May 12, 1922, fire broke out in the J.H. Weaver Produce House and spread to a store operated by Sam Shaner and also a house occupied by Mr. and Mrs Herbert Harris and her mother, Mrs Long. Mr. Harris stated that he grabbed an ax and ran across the street to sound the alarm for the fire, he was seen running by Brown Hicks, who also saw the fire and thinking the man running had set the fire he grabbed a gun and took after him, but others who had gathered and saw what had happened kept him from shooting. May 22, 1925, the hatchery or Weavers' Produce burned again and after this fire Mr. Weaver moved the hatchery part of the operation to a new building, which still stands (Shaner's Shop). 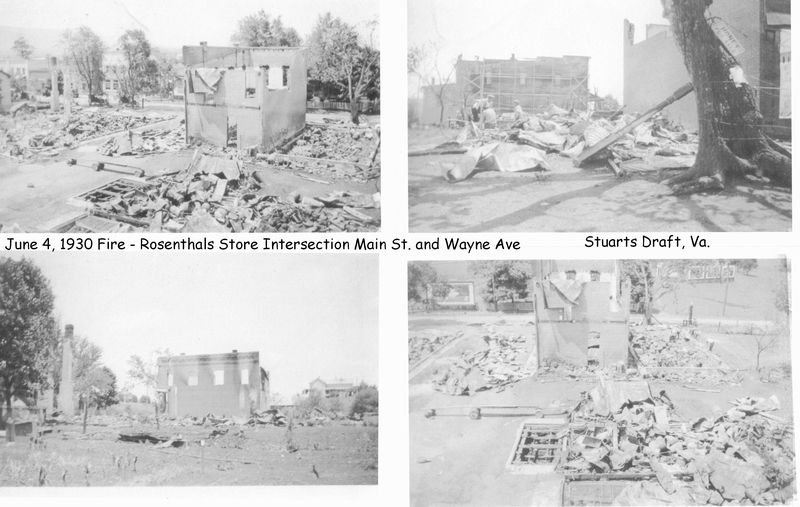 On June 4, 1930,the town suffered a most disastrous fire, which started in the building owned by Rosenthals Store and operated by him. This spread to the house and barber shop beside it. On the other side of the street, it burnt the Stuarts Draft Pharmacy, Bolick's Hardware, two warehouses, two garages and a part of Herbaugh's Grocery Store. This about cleaned out the upper end of the village. In 1942 fire broke out in the Peoples Bank on Thanksgiving Day (Currently Law office of Frankie Coyner), causing extensive damage. The next fire several years later, was Flory's barn (Hershey Plant site), which was in the winter with the temperature below zero, which hampered firefighting and the barn and a number of cows were destroyed. It is no wonder that the need for fire fighting equipment was being felt and so far all Stuarts Draft had was the alarm, a two wheeled cart and some volunteers, who did what they could until a Fire Company could arrive. On March 13, 1942 a meeting was held to organize a fire company, with Mr. O.R. Engleman to head it, and Mr. Pilson Cohron, Secretary and Treasurer. Out of this effort came two fire hydrants, costing $15.00 each and $17.52 for fittings. Of interest, was a notation that the school children contributed $5.35 on this. No minutes were recorded after May 1943, until March 2, 1946, when a reorganizational meeting was held and Mr. Engleman was again made Chief. The first item of business was to buy 500 feet of hose from Mr. George Wheatley at a cost of $65.00 and considered soon after was the purchase of four fire hydrants and 1000 feet more of hose. A chemical tank was gotten at the cost of $168.00 of which Augusta County Supervisors paid half. Pledges were taken to pay for these and 500 foot of double jacket hose, instead of 1000 feet of other hose. This was September 23, 1947, The next minutes are June 7, 1950 when the Volunteer Fire Company was formed with 47 present, who agreed to assume responsibility for paying for a 1939 Chevrolet fire truck which the Ruritans had bought from the Forestry Service for $525.00. Approximately one year later an identical truck was purchased also from the Forestry Service. On September 1950, it was decided to build a fire house, which was built in 1951 on property obtained from Mrs. Oscar Cohron. Volunteer labor did most of the construction work and the community helped with the finances. Mr. B.B. 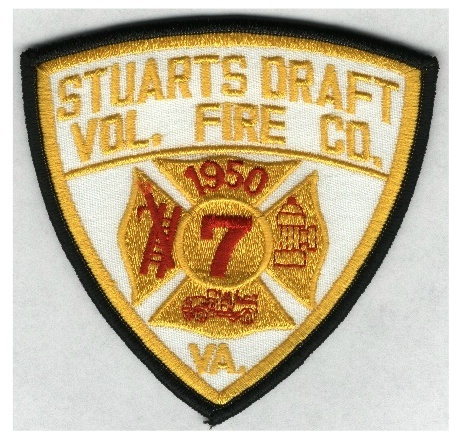 Kube came to Stuarts Draft in 1913 and soon became associated with the volunteers in the fire fighting effort. He probably attended, or dispatched volunteers to every fire until he died. He took the fire calls for a number of years in his home across the street from the fire house and ran across the street to ring the siren. In 1963 an installation was made in his home that allowed him to ring the alarm from there. His major task at all Lawn Parties was directing traffic. His faith and dedication are just one of the reasons Stuarts Draft has had such a successful Volunteer Fire Company.